Ex Cathedra is a leading UK choir and Early Music ensemble with a repertoire that reaches from the 12th to the 21st centuries. 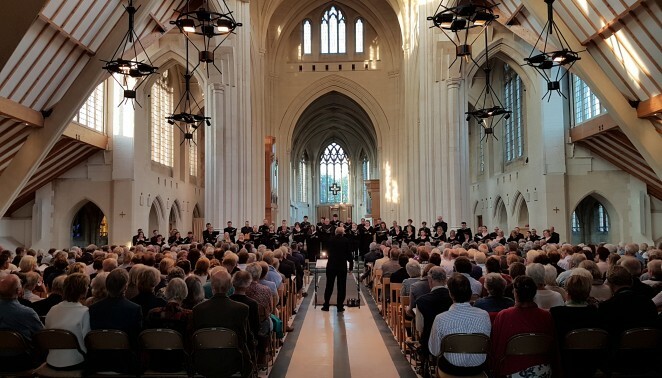 We are known for our passion for seeking out the best, the unfamiliar and the unexpected in the choral repertoire and for giving dynamic performances underpinned by detailed research. Founded in 1969 by Jeffrey Skidmore, the group has grown into a unique musical resource, comprising specialist chamber choir, vocal Consort, period-instrument orchestra and a thriving education programme, aiming to explore, research and commission the finest choral music and to set the highest standards for excellence in performance and training. We present a series of concerts in Birmingham, where we are a resident ensemble at Town Hall & Symphony Hall, across the Midlands, and in London. We also enjoy invitations to appear at festivals and concert series across the UK and abroad. Recent high-profile performances have included Stockhausen’s World Parliament, the world premiere of James MacMillan’s oratorio Seven Angels, and the world premiere of A Shakespeare Masque by the Poet Laureate Carol Ann Duffy and composer Sally Beamish. In recent years the group has performed in Belgium, Germany, France, Spain, Italy and the USA. There have been collaborations with Fretwork viol consort, The City Musick, His Majestys Sagbutts & Cornetts, Concerto Palatino, Birmingham Opera Company, Sinfonia New York, the CBSO, Birmingham Royal Ballet, Quebecois dance company Cas Public, the Shakespeare Institute, and the Shakespeare Birthplace Trust. Ex Cathedra has made a significant number of highly regarded recordings for ASV, Hyperion, NMC, Orchid Classics, SOMM, Signum, and on its own label. A French Baroque Diva won a Gramophone Award in 2015, with Brazilian Adventures and our recording of Alec Roth’s A Time to Dance amongst recent releases. A CD of choral music by Roxanna Panufnik “Celestial Bird”, featuring two Ex Cathedra commissions is forthcoming in 2018. Our extensive programme of award-winning schools and community projects is delivered by a team of expert vocal tutors, who are all members of Ex Cathedra. Singing Playgrounds has reached over 700 primary schools across the UK and also schools in Belgium, China, New Zealand, Singapore and Thailand, and the project has won the ‘Best Musical Initiative’ Award at the Music Teacher Magazine Awards. Singing Medicine reaches children on 18 wards every week at Birmingham Children’s Hospital, and Singing Pathways provides a weekly group session with adult stroke and dementia patients at Solihull Hospital. Nurturing talent is at the heart of our work, and our Academy of Vocal Music provides a choral training pathway for children and young people ages 4-18. We welcome enquiries. The Academy choirs regularly perform alongside Ex Cathedra in our concert series and appear in their own right, providing the offstage chorus for Birmingham Royal Ballet’s performances of the Nutcracker and the choir for the annual Swedish Santa Lucia service at Birmingham Cathedral. Over the years, Ex Cathedra has played a role in the development of some outstanding musicians. A long list of singers credit Jeffrey and Ex Cathedra for the opportunities they received at the beginning of their careers. Our choral Scholarships programme now provides a year-long scheme for recent graduates seeking to establish their professional singing career, and our Student Scholarships provides opportunities for singers studying at the Royal Birmingham Conservatoire. We are often asked about our name. ‘Cathedra’ is the name for a bishop’s throne, and a cathedral is the building that houses that throne. When Jeffrey Skidmore and one of the founding members of the choir were choosing a name for the new group in 1969, they chose Ex Cathedra because it literally means ‘from the throne’ or in English usage ‘with authority’. At the time, Jeffrey and several members of the choir sang at Birmingham Cathedral. The pun was attractive, but researching and understanding the repertoire so that it can be performed with authority, style and passion has been a guiding principle since those first performances.